This July, The 2019 XPoNential Music Festival at Wiggins Park and BB&T Pavilion on the Delaware Riverfront in Camden, NJ will mark the 26th consecutive year that the Philadelphia public music radio station, WXPN 88.5 FM, has presented a summer outdoor music festival. This year's event will feature 35+ diverse artists performing on three stages with plenty of activities for kids in the 4-acre Camden Children's Garden, and excellent/affordable local food & drink vendors, including Dogfish Head beer. Day 1 headliners feature Hozier, Japanese Breakfast and Philly's own experimental collective, Killiam Shakespeare. Supporting acts on the Wiggins Park Marina & River Stages include the return Dawes, Nashville's Rayland Baxter, and R&B singer Betty Lavette. We'll also see the XPN Fest debut of Clarksdale Mississippi's 20-year-old blue sensation, Christone 'Kingfish' Ingram, with London-based pop prodigy Nilüfer Yanya, and Philly's own blues/rock quintet, Foxtrot & The Getdown. ​Day 2 headliners bring us Elvis Costello & the Imposters and Blondie at the BB&T stage with the Wiggins Park stages featuring St. Paul & The Broken Bones, The Wood brothers, Philly's own Low Cut Connie and J.S. Ondara. Plus, we'll see Sister Sparrow & The Dirty Birds, Caroline Rose, Y La Bamba, The McCary Sisters, Ali Awan & the Vaughns in addition to many artists representing indie rock, African, gospel, rap & hip-hop and more. At the Wiggins Park Waterfront & Marina stages on Sunday, Day3, the festival brings the Indigo Girls' Amy Ray Band with Guster, Kathleen Edwards, Gregory Alan Isakov, Dave Hause & The Mermaid, Lucy Dacus, The War and Treaty, Ruston Kelly, Sean Ardoin, RFA and Zeek Burse. See the full 3-day lineup below. Tickets for the Saturday, July 27 performances at BB&T Pavilion with a “Saturday Festival Access” add-on option for Wiggins Park stages will go on sale at 10:00 a.m. this Saturday, April 6. 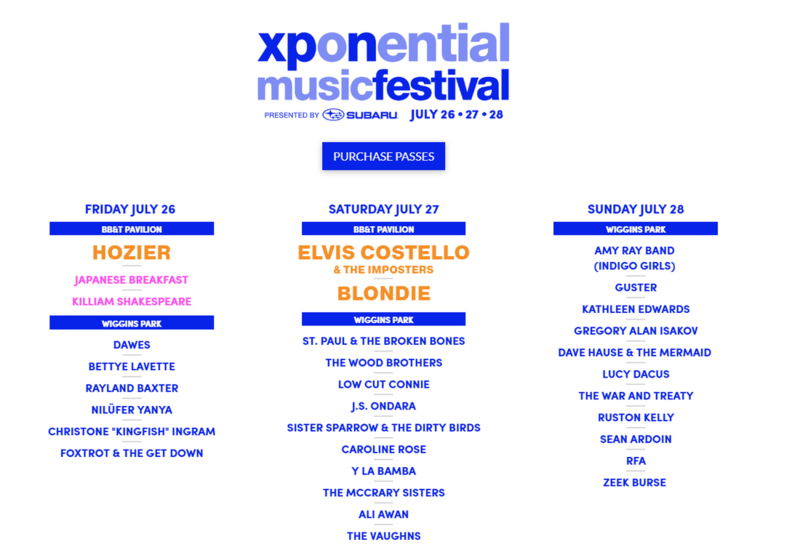 See all ticket options including 3-Day Go Everywhere Passes available at xpnfest.org.